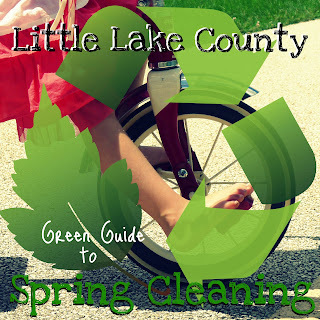 Welcome to Little Lake County’s Green Guide to Spring Cleaning Series where we will share our favorite green cleaning tips, ways to simplify your home, and ideas for the kids to help. Follow us room by room to transform spring cleaning from a dreaded annual chore to a healthy and productive family activity. You can use the same all-purpose cleaner we used in the kitchen for all surfaces in the bath, it even works on glass. However, I recently came across the following glass cleaner recipe and it works wonders on my bathroom mirrors. Kristy’s Glass Cleaner 1/4c vinegar – 1/4c alcohol– 1T cornstarch – 2c warm water – Put in a spray bottle, shake up before each use. 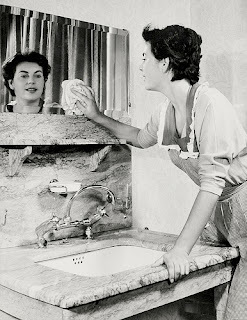 Now this is going to sound odd, but I clean the shower/tub and toilets just about the same way as I clean the oven. Sprinkle baking soda, spray with vinegar-based homemade spray, wait a few hours and scrub, scrub, scrub. If you’re not seeing enough bubbles, just spray straight vinegar on the baking soda. Once it is clean to my liking, I rinse it all away then spray another layer of cleaner and wipe down with a dry cloth to shine. For the shower, I sprinkle borax in addition to the baking soda for extra scrubbing power and spot treat any mildew in my grout with hydrogen peroxide. I recently read that you can pour a can of Coke in the toilet, scrub it, wait a few hours before scrubbing again, and it will get rid of even the most stubborn stains… Have any of you tried this? It’s probably a healthier cleaner than it is a beverage, but remember to recycle the can! If you have any slow drains, use the same system that I described in my kitchen post. My bathrooms seem to be a mess of random old stuff that I never use. I have made a commitment to try to clear out the clutter and keep it from getting out of control. Medicine cabinet: Look at all your medicines and trash or replace expired ones. The FDA has published guidelines for the safe disposal of unused medications. Check it out here. Makeup: How many trial size gift-with-purchase items are you stashing? If you aren’t using them, chuck them! Towels: Have your towels seen better days? Do you have several sets in outdated colors that you no longer use? Towels still in good condition can be donated * and the mangier ones can be moved to the rag pile for future cleaning jobs. Lightbulbs: Change out those burned out lightbulbs that you’ve been avoiding. This could be a great time to switch to CFL’s if you haven’t already. * If you have unused deodorant and razors you know you won’t use, rather than discard them donate them to PADS of Lake County along with your gently-used bath towels. PADS of Lake County provides emergency shelter and support services to homeless families in our area and the above-mentioned items are in urgent need. 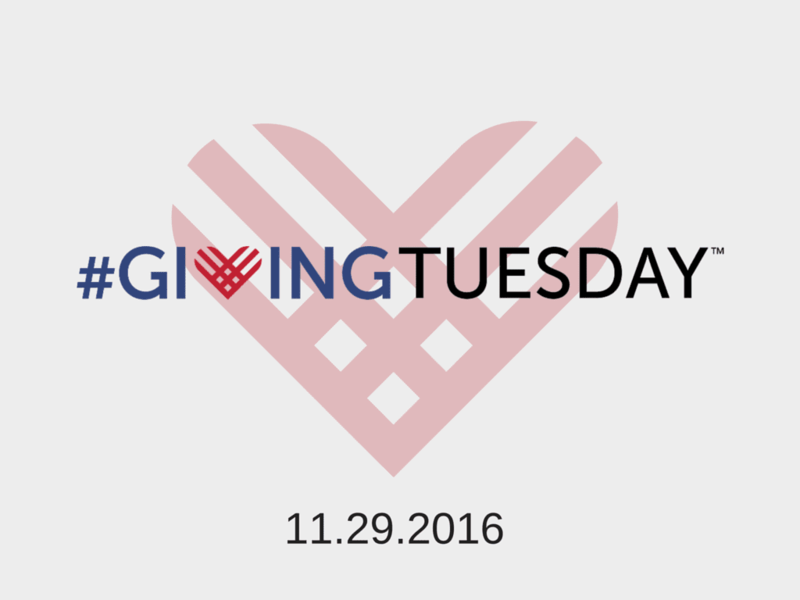 For a complete wish list of items, click here. Tub cleaning has become a particularly favorite job for the kids in my house. The aforementioned baking soda and vinegar explosion is a lot of fun for my kids. I even let them use extra and do it themselves for extra effect. Give them scrub brushes and they go to town. They are also happy to wipe counters, be garbage movers, and wipe down floors. A basket of soapy water and some rags and my daughter can be just like Cinderella. Kristy is the mother of two young children, who join in her quest for unique restaurants, fun places to play and a little personal sanity in the process. She does her best to teach her children healthy habits, kindness, compassion and a love of nature while also learning that sometimes we need to let go of our ideals in the name of fun. This has been very helpful so far… not too overwhelming, but covering all the basics to get me started. Thank you!